LITTLE ROCK, Ark. 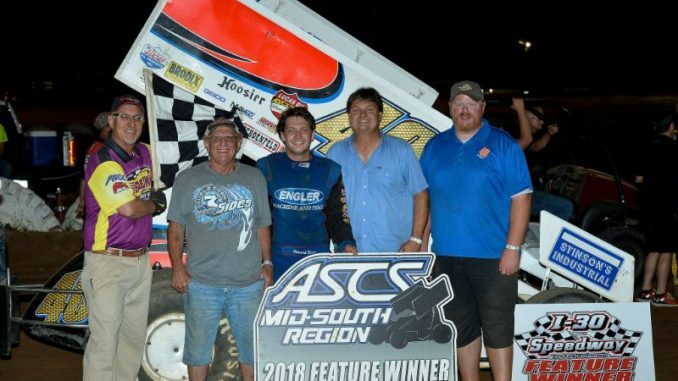 (June 30, 2018) – Making it two wins in three nights of racing, Tennessee’s Howard Moore led every lap but the first one at I-30 Speedway; netting him $2,000 and marking his fourth career victory with the ASCS Mid-South Region. Taking the green from the right of the front row, Moore chased Zach Pringle around the Arkansas quarter-mile to start the night’s 25 lap affair. Working by the following lap, Moore ran to the checkered flag ahead of Tim Crawley who made his way to second from sixth. Derek Hagar in tow from seventh made the night’s podium. Zach Pringle ended up fourth with Louisiana’s Dustin Gates rolling to fifth from 15th. Charlie Louden crossed sixth with Justin Webb seventh. Rick Pringle, Ernie Aisnworth, and Wally Henson from 17th came up to finish 10th. The ASCS Mid-South Region wraps up the four-night Speedweek at Diamond Park Speedway in Murfreesboro, Ark. on Sunday, July 1 with another $2,000 top prize on the line. Gates open at 5:00 P.M with racing at 8:00 P.M. Admission is $21 with kids admitted for $15. The night will also include an Independence Day Weekend Fireworks Show. For more information, log onto www.diamondparkspeedway.com.